Capricorn College is a product of a merger of three Colleges with very distinct and diverse historical backgrounds. These were the former Pietersburg Technical College (PTC), Bochum College of Education and the former Northern Province Community College (NPCC).Capricorn Colleges for FET has become the first choice institution for further education for many young people as the programmes offered directly respond to the priority skills demands of the South African economy. The College further offers theory and practical learning. There are many exit options for young people to choose. Capricorn College is a product of a merger of three Colleges with very distinct and diverse historical backgrounds. These were the former Pietersburg Technical College (PTC), Bochum College of Education and the former Northern Province Community College (NPCC). 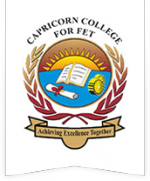 Capricorn College for FET has become the first choice institution for further education for many young people as the programmes offered directly respond to the priority skills demands of the South African economy. The College further offers theory and practical learning. There are many exit options for young people to choose. -continue to ensure that sound democratic governance and management processes are in place to create a conducive atmosphere for teaching and learning and continue to work with its stakeholders in order to improve quality and accessibility of educational opportunities. -develop, strengthen and ensure quality student support as well as implementation of responsive, student-centred vocational and career programmes. -continuously strive to improve administrative efficiency and effectiveness by employing competent human resources and develop quality systems which will permeate every process, system, classroom activity, programme and service. -continuously strive to improve fiscal and physical resources in accordance with Public Finance Management Act (PFMA) and General accepted Accounting Principles (GAAP) management and administration of resources as well as implementation of Vocational and Career programmes in accordance with relevant policies in campuses.